A new study indicates that the number of plant and animal species at risk of extinction may be considerably higher than previously thought. A team of researchers, however, believe they've come up with a formula that will help paint a more accurate picture. The study appears in the journal Biological Conservation. The maps describing species' geographic ranges, which are used by the International Union for Conservation of Nature (IUCN) to determine threat status, appear to systematically overestimate the size of the habitat in which species can thrive, said Don Melnick, senior investigator on the study and the Thomas Hunt Morgan Professor of Conservation Biology in the Department of Ecology, Evolution and Environmental Biology (E3B) at Columbia University. "Concerned about this issue, we aimed to determine how far off those maps were. In doing so, we found there is an enormous amount of freely available data on many species around the world that can be employed to get a better picture of exactly how many species are truly under extreme threat. This picture, grim as it may be, is necessary if we are going to accurately plan the steps needed to stem those threats, locally and globally." Currently, IUCN makes use of species sightings reported by experts to draw boundaries reflecting the geographic range of a given species. From these maps, the IUCN develops its Red List, which assigns a threat status to wild species: Vulnerable, Endangered, or Critically Endangered. Though the accuracy of threat risk assigned to a species relies heavily on these maps, Melnick and his colleagues believe they almost always overestimate the actual distribution of a species by incorporating areas of unsuitable habitat. This overestimation of range size, in turn, leads to a significant overestimation of population size and therefore an underestimation of extinction risk. In an effort to determine how exaggerated the IUCN range maps might be, the team analyzed the maps established for 18 endemic bird species with varying IUCN-assigned extinction threat levels inhabiting the Western Ghats mountain chain of southwest India. Melnick's student, Vijay Ramesh, and two other researchers from India studying in the United States, pored over data from the world's largest citizen science database (eBird), and also gathered freely available and geo-referenced data on the climate, vegetation, ecology, and geo-physical attributes of the Western Ghats. The team then used local experts to sift through those data and verify their accuracy. By bringing together carefully curated citizen science data on the sightings of each species with the other data types, they were able to build a profile of where each species is likely to be found - at what elevation, at what temperature range, in what types of vegetation, etc. This allowed them to estimate new geographic ranges for each species that they believe are much more accurate than the IUCN range maps. 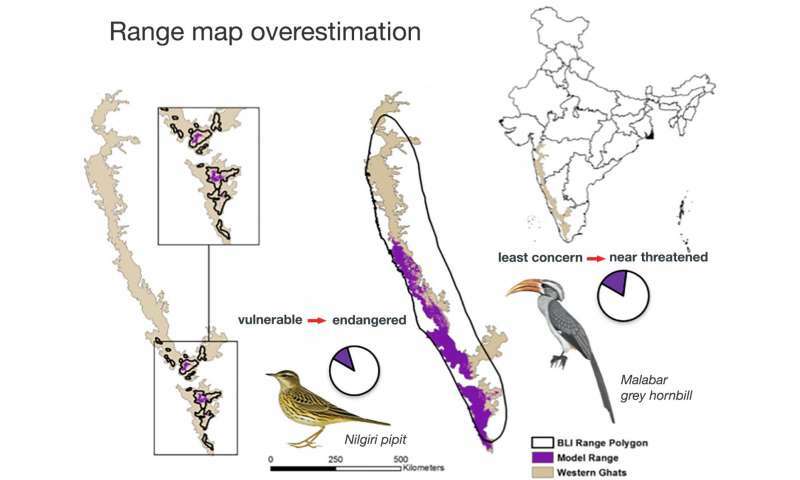 Range maps have been overestimated for both high elevation specialists such as the Nilgiri pipit (Anthus nilghiriensis) shown on the left to low elevation species such as the Malabar grey hornbill (Ocyceros griseus) shown on the right. The new range estimates from the Columbia study revealed that the IUCN maps for 17 of the 18 bird species contained large areas of unsuitable habitat and vastly overestimated their ranges. 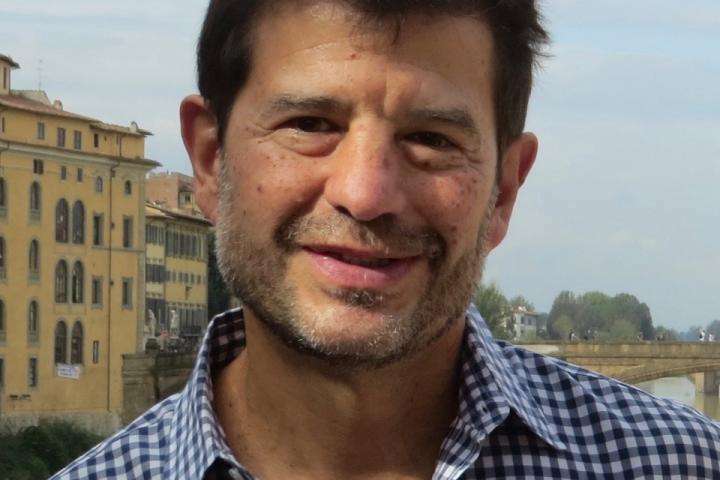 By extension, the threat levels which are correlated to species range size are probably underestimated, Melnick said, and the study suggests that IUCN threat status for at least 10 of the 18 species should be elevated. "We were extremely surprised by how much the IUCN ranges overestimated what we deem the true ranges to be," he added. "In a number of cases the ranges were overestimated by an order of magnitude. 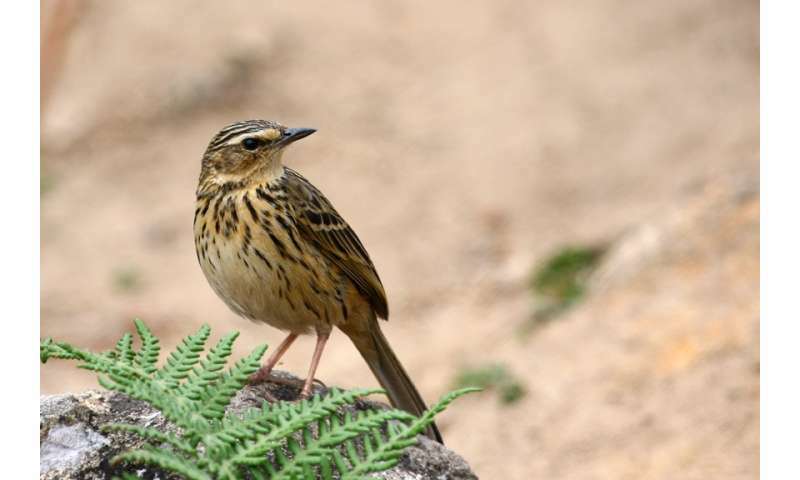 The drastic reduction in range size and the increased habitat fragmentation that our study indicates leads us to infer that there is a much greater threat to these endemic birds than was ever imagined." The study points to a new way of estimating species ranges for conservation purposes, Melnick said, adding that the use of freely available, digitized, and geo-referenced citizen science data, along with biological and geophysical data, and sophisticated statistical modeling can and should be applied to plant and animal species around the globe so that IUCN can more accurately assess the threat to species worldwide. 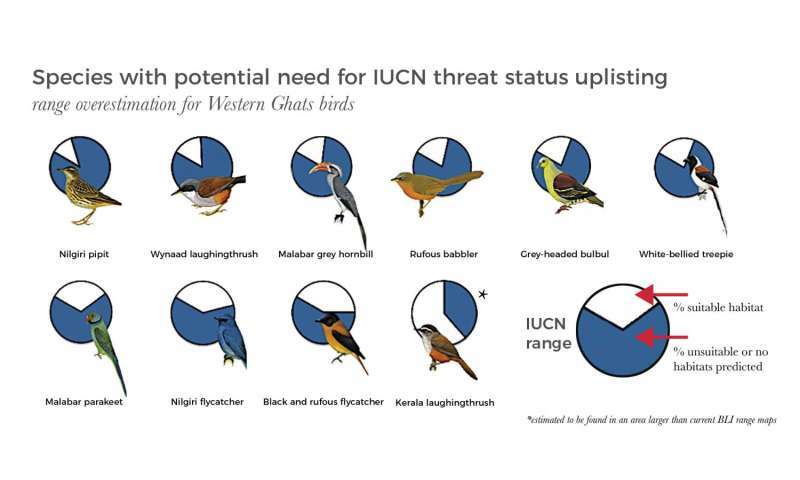 "IUCN's criteria for establishing threat levels for species are excellent; however, the data to which those criteria are being applied need to be updated using an approach like the one we have developed for the Western Ghats," Melnick said. "By using citizen science data in a careful way, we may find there is an urgent need to start protecting species we thought were flourishing but are actually in danger of spiraling toward extinction."